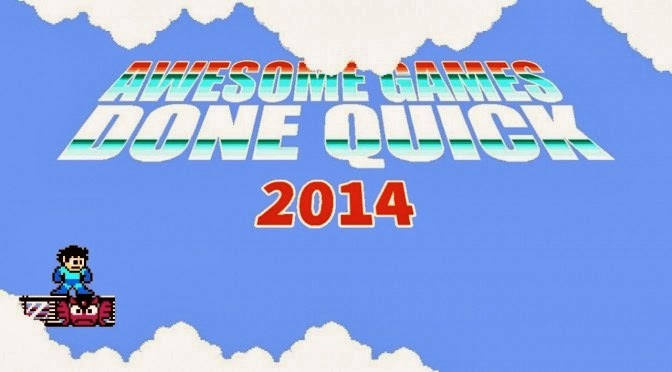 As I type this, Awesome Games Done Quick 2014 is just wrapping up. 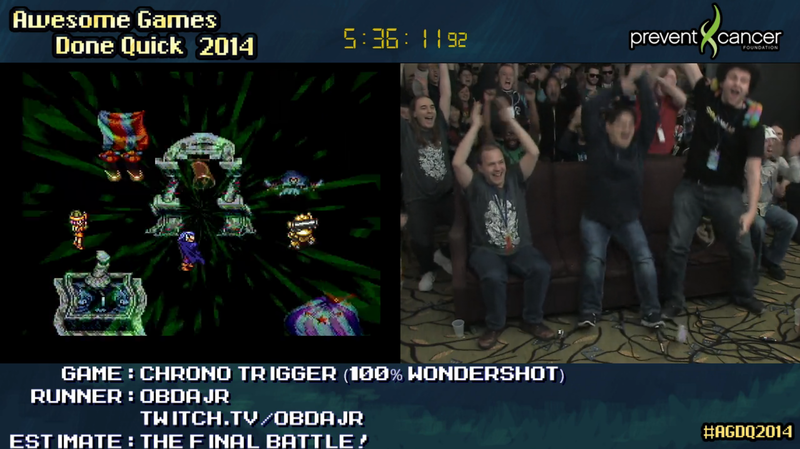 What is Awesome Games Done Quick you ask? Well it's a week-long speedrunning marathon for charity. Games Done Quick events have been been going on for a few years now, and they have been growing pretty rapidly each time. Three years ago a handful of guys in a basement raised $10 000. This time around a crew of 500+ people rented out a hotel for a week and raised $1 000 000 for the Prevent Cancer Foundation. The scale of these events are amazing, they are practically a mini-convention at this point, and obviously $1 000 000 for charity is incredible. So perhaps you are also wondering what exactly speedrunning is. It's pretty self explanatory, but it essentially entails playing a video game from start to finish as quickly as possible. It sounds simple, but in practice it means extremely skilled players with a lot of knowledge about their chosen game, and a plethora of tricks and glitches that make the game do things you never thought it could do. It's really entertaining to see such high level play, and the way some of the glitches work is fascinating, especially if you are familiar with how games are made or know something about programming. I make this post for two reasons, but essentially it's just because Games Done Quick events are amazing. Generating so many donations for charity is hugely worthwhile, and it's super entertaining to see such a wide variety of games get ripped apart. Marathons tend to be especially entertaining, because the focus is a little more on showmanship and commentary. So keep an eye out for more of them in the future, Summer Games Done Quick should be happening in about 5-6 months, and there are several smaller events popping up all the time. Keep an eye on gamesdonequick.com and forum.speeddemosarchive.com. So if you aren't convinced that Games Done Quick is worth watching, watch these clips. In fact watch them anyways, because they are freaking amazing. And all 3 of them happened within about 6 hours. I don't really know the game, but it's a good run and Bonesaw is an entertaining guy. Good way to start the marathon. If you know the game, you can probably imagine how entertaining it is played super well and super fast. Unfortunately not many people run it, but it's a really great watch and tminator64 is a charismatic fellow. Both very short, but demonstrates what's called a Tool Assisted Speedrun. As the name implies, it uses emulators to record a set of inputs which will play the game more perfectly than is possible for a human being. It's pretty impressive, and what they were able to do with Super Mario World is especially impressive. This is a fairly long run, but Yoshi's Island is one of the most technically impressive speedruns I have ever seen, and Tri-hex is a great showman with a very fast and chaotic play style. It's worth seeing at least some of it. This race can't not be bad. These 2 are the top 2 in the world in a very optimized run of a really good game. Just to make things more interesting, they even have a slightly different route through the game. This race was great. SotN is a great game, Richter is really hard and requires an insane amount of skill and practice to play this well, and it was a very close race, too. This is here mostly just because I love this game and I love this run. romscout is insanely good at it, and this run ended up being really really good. This game is really hard, and this guy is really good. To add to the hype they upped the difficulty a bit more by donating to add a couple challenges, and it's just pretty exciting all around. Lots of people consider this one of their favorite runs of the marathon. Longish run, but very entertaining I think. Lots of pretty crazy glitches, a couple developers on Skype, the 4 guys have a good repor etc. It's kind of hard to appreciate how crazy it is, but it's a fun time. I find it really interesting how well planned out the run is, considering that it has to be optimized for all 4 players, who often go off and do 4 completely different things. Enough said, really. Playing any game blindfolded is clearly very impressive. This one was a really strong contender for top-3, but there were so many other amazing runs that it barely got edged out. Obviously similar to Punch-Out, but the whole thing was just a little bit more hype. The game itself has a bit more punch to it, the runner is a bit more animated, it was a little more touch and go, and Mike Tyson isn't around to ruin all the fun. Easily one of the most fun runs I've ever seen. Majora's Mask is a pretty cool run, and this one went pretty well. I will say however that MM has this problem where you have a ton of setup and not enough payoff - there are long periods of the run where not a lot happens. This race was really really good. It was quite close, and it does a really good job of demonstrating the absurd level to which tricks and glitches open up this game. I recommend this one pretty strongly, though it might be hard to follow both guys if you don't already know a bit about OoT speedruns. Metroid Prime runs are always pretty popular, they've been around for a long time and are just pretty cool on the whole. I'm not a big fan of the runner, but they also had one of the game's developers on Skype which was pretty awesome. This is easily one of the top 3 runs of the marathon. Super Metroid is a great speedrun to begin with. Add in a stupid close 4-man race and a couple hundred people in the room, some of the best commentary of the marathon, and the hype is insane. Seriously, if you didn't watch it, go do it. This run is interesting in a bit different way, being low%. In other words Dragondarch purposefully avoids as many upgrades as possible while also playing on hard mode. This category is more for insane challenge than a fast run, but he pulls it off. A really tense hour+ of really skilled play. This run is nuts. First off - these two are both playing the game. Essentially one guy moves and the other shoots. Goldeneye speedrunning is insanely optimized and pretty intense to begin with, and it happens that their time still manages to be really really good. Also Goose is the living embodiment of hype. I suppose it also helps that 7/8 of the games before this one were all really awesome (hint - the last 7 games on this list). Mario 64 is a really impressive run just in general. Peaches isn't as amazing as some other players, and obviously playing one-handed is going to reduce the quality of his play. But like, he's playing one-handed. That's fricking insane. I'm going to be totally honest- don't watch this whole run. It's almost 6 hours long and it's a turn based RPG, so it's kind of hard to really appreciate a lot of the little things going on. Outside of nostalgia it's not the best watch. However this was the last game of the marathon. The last 40-60 minutes or so were pretty cool just in terms of gameplay. Combine that with the fact that there was a mad dash at the end to see if donations could actually hit the 1 million before the end of the run. Both things combined make for a pretty insane end to the marathon, all set to World Revolution. You can watch from about here if you want to see what I mean.